With Hinckley currently sitting just two points behind league leaders Stourbridge – thanks to nine wins from their first 11 matches – you would have to put them in the bracket of potential promotion contenders. After moving into National Two North in 2016, the Midlands club is certainly heading in the right direction – highlighted by eye catching displays against Macclesfield, Blaydon and Tynedale this term. By Captain Alex Salt’s own admission, it still early days for his side, but he admits the club do have ambitions beyond the fourth tier. After moving into National Two North in 2016, the Midlands club is certainly heading in the right direction – highlighted by eye catching displays against Macclesfield, Blaydon and Tynedale this term. By Captain Alex Salt’ own admission, it still early days for his side, but he admits the club do have ambitions beyond the fourth tier. Promotion to the third tier would be an outstanding achievement for the ever present Salt, who has featured in all but one game for the club this season. The skipper was absent for their defeat to Sale FC, but despite being at Leicester Road for the best part of 15 years, Salt is keen to continue contributing to Hinckley’s rise. He added: “When I first became involved with the first team about four or five years ago, we always had a strong core. Some clubs at this level don’t really have a ‘club ethos’ about them and by that I mean making sure the senior teams have a really good bond and we at Hinckley have that. For now, Hinckley will just be focused on the next five games heading into the Christmas period. At the start of this season, George Chuter took of the reins at Leicester Road and after finishing in a very credible mid-table position last term, they are now in the process of taking the next step. 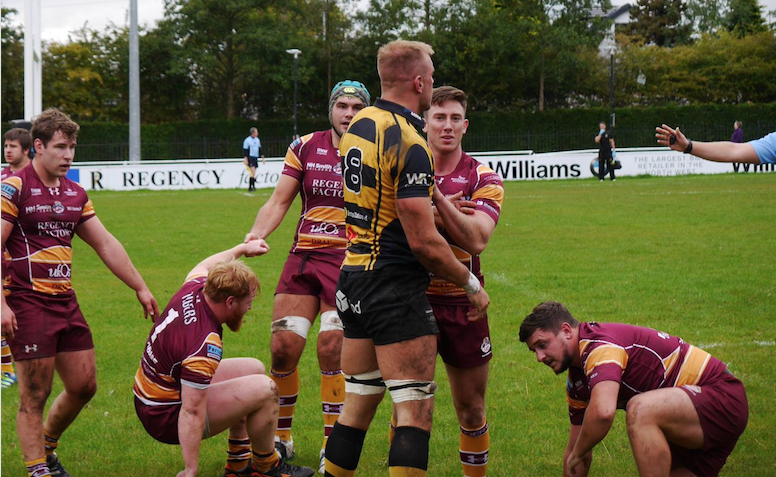 The Midlands side head into this weekend’s clash with Luctonians on the back of six wins from their last seven games and Salt is confident they can start the New Year in a positive position. “We are ultimately judged on league position and we are in a strong position at the minute”, added Salt. “We have always done quite well around Christmas time. “I think a few clubs struggle when the nights get start to get cold and the pitches get muddy and horrible. We get quite good numbers to training and the players stay fully committed. “We have got Luctonians coming up and we also play Stourbridge which is going to be the big test in two weeks’ time. Personally and as a team, we don’t fear anyone in the league. “You play to win. You enjoy it, but you enjoy it when you win. The club is in a great position and having known the chairman for a long time, I do think his ambition is to see Hinckley in National One and be sustainable at that level. Maybe not this year, but certainly in the next few years.